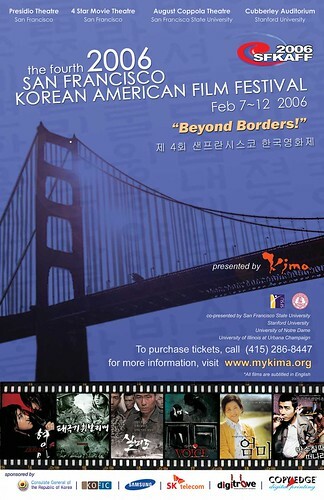 The 4th San Francisco Korean American Film Festival will showcase 38 films, including 17 Korean American works, contemporary South Korean features and special screening of a North Korean film. Four public forums will also discuss this year's theme, "Beyond Borders: Demystifying the Korean Image through the Media Arts." This is the only festival in the United States that celebrates Korean and Korean American media arts. The Festival is co-presented by Korea Studies in Media Arts (KIMA) and Stanford University.